It’s my birthday week, which means I’m choosing all of the names featured. And since I have a soft spot for swans, this Friday’s list is all about the birds. Swans are graceful, beautiful, and surprisingly fierce. But while avian-inspired baby names are quite stylish, swans are often overlooked as a source of inspiration. We’ve embraced it as a fictional surname. There’s Bella Swan of the Twilight series and swashbuckling Elizabeth Swann of Pirates of the Caribbean. People with the given name Swan? They’re rare. Though I think it makes a great, daring middle. 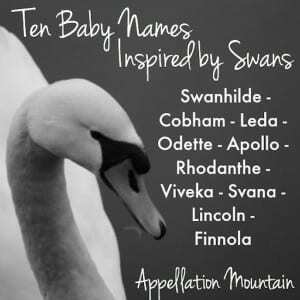 But swan-inspired baby names are plentiful. Read on for ten of the more interesting possibilities. And yet, I find Cobham a little awkward to say. It sounds more like “cob ’em” than Cobham. That might be my accent. Or maybe it’s the reason that Cobham has never caught on. Cob – or maybe Cobb? – might be an interesting option, especially in the middle spot. Except, corn on the … No, not sure that works as a given name. Though maybe there’s a Jacob out there who goes by Cob instead of Jake? The feminine equivalent of Cob is Pen, which brings to mind Penelope. But that might be a stretch. Another out-there option? Cygnet, as in a young swan. Love elaborate R names like Rhiannon and Rosalind? Here’s one with a botanical tie and a cygnine twist, too! In Australia, the Swan River Everlasting is a light pink flower. Scientific name? Rhodanthe manglesii. The drawback? While I think the sound is lovely and it’s reasonably wearable, it might be far too obscure to feel like a swan name. And, like Cobham, it’s not used as a given name, so it’s a truly bold choice. The chief advantage of Svana? 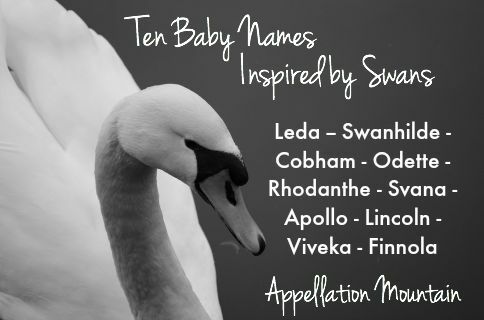 It sounds much more like swan than any of the other swan-inspired baby names so far! The chief disadvantage? While Svana is a real given name in Icelandic, it doesn’t sound much like a name in English. And yet, it could work. 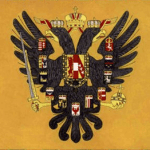 The ‘sv’ sound occurs in other languages, like the Russian Svetlana. And Svana isn’t a million miles away from other ends-in-a names for girls. It comes from the Old Norse word for swan – svanr. Swedish design firm Svan used the name for a highchair design, which increases the possibility that other parents will recognize the sound. Moving on to myth! Fenella is an Anglicized form of Fionnuala or Finnguala. Short form Nuala is now bestowed as a given name, too. Fenella had a wicked stepmother who turned her and her brothers into swans. The children were trapped in their cygnine form for 900 years. The story is called The Children of Lir, and it’s well-known. Fenella isn’t common in the US, but it’s not unknown. Actress Finola Hughes wears yet another form of the name. Sir Walter Scott used the name for a minor character in his 1823 novel Peveril of the Peak. And the -ella ending is quite current. Swanhilde appears in the history books from the early Middle Ages forward, the name of several princesses and women religious. There’s a Svanhild in Henrik Ibsen’s play, Love’s Comedy, another in the ballet Coppelia, and a third in the opera Hulda. None of them are household names, and let me admit that Swanhilde? Not exactly the easiest name to wear to kindergarten, even in our anything-goes age. But I find Swanhilde a fascinating rarity from the history books, and might be a bold middle possibility. Apollo is associated with a great many things. Healing, the sun, an Olympic champion speedskater, Gwen Stefani’s youngest child. 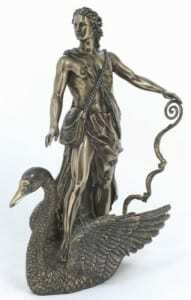 Swans were sacred to the Greek god. One of the lesser-known tales about Apollo is that he rode on the back of a swan to winter in a slice of paradise known as Hyperborea. Better yet, Apollo is a very wearable name. It ranked #801 in 2014, up over 150 places from the year before. Gwen Stefani welcomed a son named Apollo in February 2014, so the name has gotten quite a bit of exposure. Big brother’s name, Kingston, has gone from seldom heard to #161 since his 2006 birth. Love swans, but want something from a Catholic context? Here’s a possibility that is among the most wearable on the list: Lincoln. The twelfth century Saint Hugh of Lincoln is the patron saint of swans, and is often depicted in the company of a white swan. It’s said that a swan was his loyal companion and even served as a sort of guard dog while the saint slept. Lincoln is also a presidential surname, associated with copper pennies, stovepipe hats, Nebraska and the Civil War. So swans might not be the first thing that come to mind when you hear Lincoln. And yet, the association is a strong one. Lincoln is also the most popular name on this list by a long stretch, ranking #87 in the US. Hugh, of course, works just as well – it’s every bit as saintly and storied a choice. But Lincoln, with cool nickname Link, is an even more on-trend name in 2015. I’m fascinated by the Hindu view of swans. The creatures are sacred, and a swan’s feather is seen as a symbol for how we should live in the world. We should be present, but not attached – just like a swan’s feather is in the water, but not wet. The goddess Saraswati rides the raja hansa – the royal swan, a symbol of viveka. Viveka is the ability to discern the difference between the good and bad, the enduring and the fleeting. I’ve met men named Vivek, but I’ve yet to meet a Viveka. And yet, the name is surprisingly international. Beyond India, there’s also a connection to Sweden. Viveka is a Swedish feminine name related to the Germanic Wiebe. Actress Vivica Fox uses a different spelling; Viveca is seen, too. In our age of Olivia and Victoria and Ava, V names are seen as vibrant and appealing. Viveka – choose your spelling – could be a rare name, rich with meaning and cygnine appeal. I hear Leda, and mentally add “and the Swan.” But maybe that’s just me. It’s yet another story of the powerful god Zeus seducing a maiden, so while the association is strong, it’s not G-rated. And yet, Leda could make a great name for a daughter in our Emma-Luna moment. It’s short and complete, wearable for a child, but without sacrificing any sophistication for an adult. Leda also qualifies as an overlooked vintage gem. Back in the late nineteenth and early twentieth centuries, Leda regularly charted on the fringes of the US Top 1000. Spelling might be the tiniest bit of a headache. Blogger Heather Armstrong has a daughter named Leta Elise. I’ve seen Lida, too. 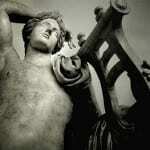 One of Leda’s children by Zeus was Helen, she of the face-that-launched-a-thousand-ships. You might make the case that traditional, buttoned-down Helen is also a cygnine name. Swan Lake might be the best known ballet other than The Nutcracker, especially since Oscar-winning movie The Black Swan came out in 2010. 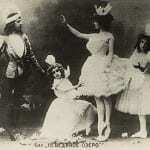 The basic premise of Tchaikovsky’s ballet is this: an evil sorcerer turns a beautiful princess into a swan. The cursed princess is named Odette. 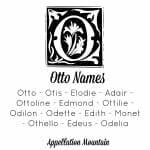 Odette is one of the Otto names that feels fresh, edgy, and unexpected, without actually being invented or new. In the ballet’s third act, we meet another Ott0-named girl: Odile, daughter of the evil sorcerer. She takes Odette’s place. She’s the black swan. The tension between good-girl Odette and the darker Odile is at the center of The Black Swan. While we’re looking at the ballet, characters from the movie could also be considered cygnine names, especially Nina, the role for which Natalie Portman won an Oscar. Would you ever consider any of these swan-inspired baby names? Do you think Cobham and Rhodanthe are wearable? How about Lincoln, Odette, and Leda? Rodanthe (Ροδάνθη) is my aunt’s name. I prefer the Rodanthe spelling, like the town in North Carolina. I’ve been trying to get my husband to agree to Rodanthe for a middle for years! I like the name Svanhilde/Swanhilde. Swan or Hildy or Anna all make the formal name wearable in this age where everything goes. Swan by itself reminds me of Snow, they are in the same category, edgy, faity-tale-ethereal, fresh and evocative. Hildy is girly and cute, the flirty sister to Hildagarde, but still strong and regal, even quirky. If parets like Odette, they make like Ottavianna. A longer frilly feminine form of Otto. Great Post! I love swans, and I was enchanted the first time I met an Odette as a kid (she was Swedish). Leda is an intriguing option. Ha, Hettie – this comment made my day!